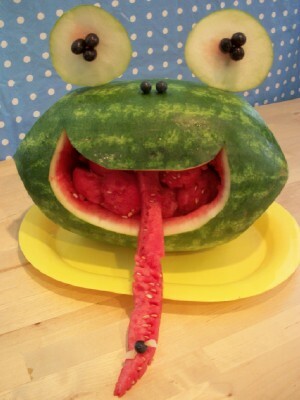 In the last two days, I came across two more really fun things you can do with a watermelon. I literally laughed out loud when I saw this frog watermelon from Kitchen Fun With My 3 Sons. How can you not smile when you see such a happy frog. This would be so much fun for a party or playdate. Then on the other end of the happiness spectrum, I also love this Angry Bird from Little Food Junction. I can now say I am an Angry Bird addict, and I understand the obsession. I had no idea what they were until I got my smart phone a few months ago. I would have got it so much sooner, had I know how much fun those angry little birds can be.